Catherine Chambers, who was born in Londonderry on the 15 Mar 1874; was my maternal great grand aunt. She was also a daughter, sister, wife and mother. Catherine was one of four children born to John Chambers and Catherine Johnston. 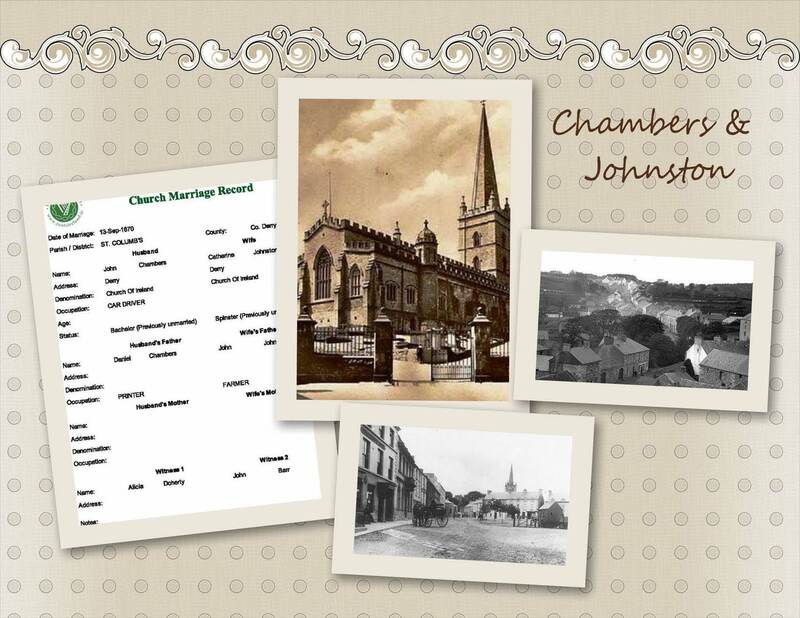 Her father John, from records I have found; was born in Glasgow, Scotland to Daniel Chambers and Mary Kelly; and her mother Catherine was born in Lough Eske, Co. Donegal to John Johnston of Donegal and Isabella Smyth of Coleraine . The family was living on Lower Road, Londonderry when Catherine, along with her twin sister Mary Ann; were born. 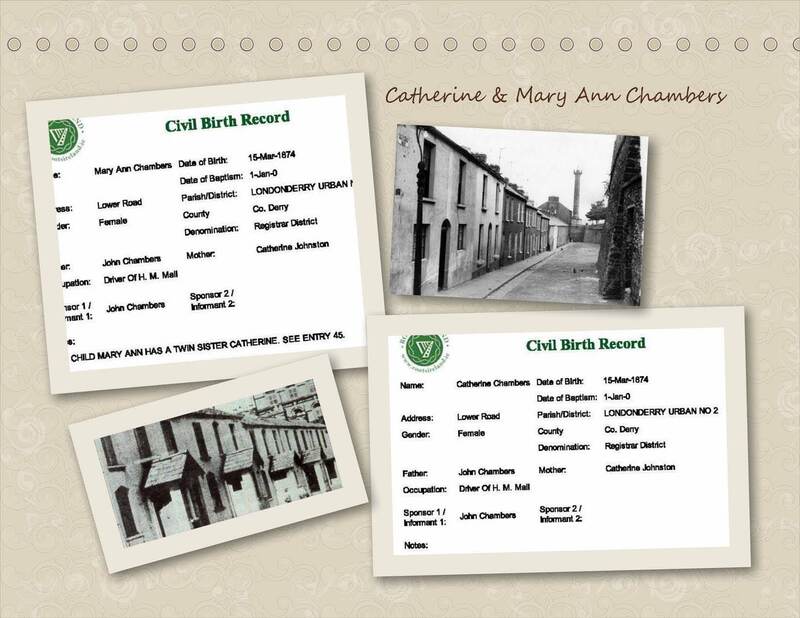 Although Catherine’s birth record did not show the Church that she was baptized in, I’m assuming it was St. Columb’s Cathedral where her parents married. Many of my family were and remain connected to the Church. So, I’ll have to delve a little further when I return “back home”on my summer trip. At some point Catherine moved to Ardnablesk, where oral family history indicates we have other family; which I still have to find. On the 22 Feb 1898 she married Adam Bustard of Milltown, Donegal. Adam was the fourth child of six born to James and Margery Bustard. As his parents had the same surname there is the possibility that they were cousins. Another twisted limb I need to follow. 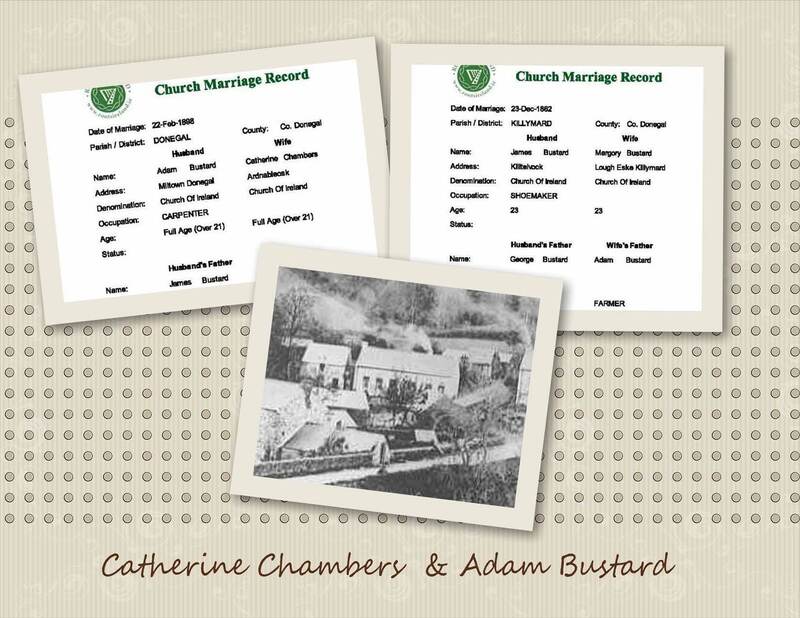 James and Mary J. Bustard, the groom’s siblings; witnessed the wedding..
Catherine and Adam had a small family comprised of one daughter and two sons. On 10 Sep 1899, when their first child, Mary Jane was born; the family was living in Tawnawully in the Parish of Lough Eske. Adam was a carpenter by trade at that time; however, by the birth of their second child, John James on 18 April 1901; he was farming as had his father before him. Their third and last child, Adam was born on 28 Nov 1903 and the family was still residing in Milltown where Adam had continued to farm. The 1901 census shows that Catherine Chambers, now known as Kate Bustard; and family were residing at 2 Milltown, Tawnawully. Adam was still farming and Kate was a “sewer”! 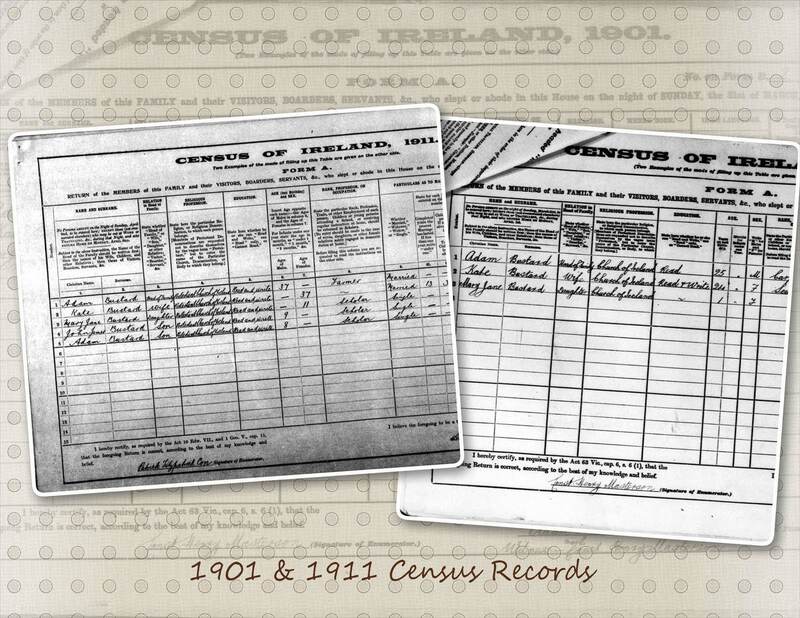 Sometime between 1903 and 1911 when the census was taken; the family had moved to 10 Ardnableask. The children were attending school, Adam was farming and Kate was a homemaker. That’s where Catherine’s story has ended for me, at this point in time anyway. I have been unable to find the death or burial records for Catherine and Adam. Nor do I know what Church they were married in! As their marriage record indicates they were Church of Ireland and married in Donegal, which might imply the Church of Ireland in Donegal Town! Or could they have been married in one of the surrounding parishes; such as Killymard, Lough Eske or Laghey? This inquiring mind needs to know! 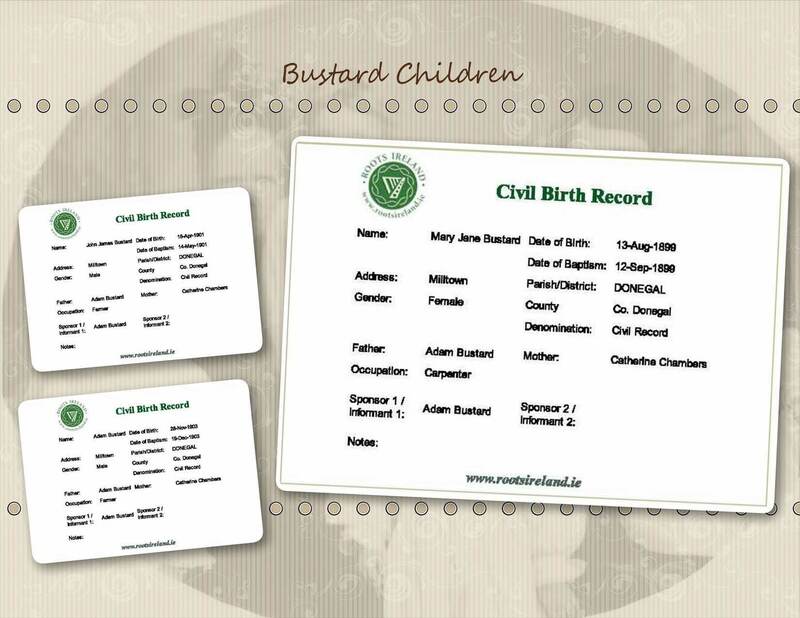 This entry was posted in Co. Donegal, Co. Londonderry, Family History, Geneaology, Ireland and tagged Bustard, Chambers Family, Co. Donegal, Co. Londonderry, Family History, Genealogy; Ireland; Records, Geneaology, Johnston Family, Smyth Family. Bookmark the permalink.